Stand for the Persecuted Church! Don’t panic! Yes, Stand for the Persecuted Sunday is this Sunday, April 17. * I am sure that if every church around the country, every church in Western Christendom, had known this fact with a bit more lead time, they would all be throwing over all their previous plans for Sunday worship and devoting it to a Sunday of standing for persecuted brothers and sisters around the world.. . .
What makes you think that passage is particularly about our response to persecuted Christians, you say? The problem is — as I say when I am speaking to churches about their persecuted brothers and sisters in the global church — in the West, we have not felt the birth pains. To follow on with Jesus’ women-in-labor metaphor, with which a certain segment of us in the population can identify more than others! — Western churches have had an epidural. Then you will be handed over to be persecuted and put to death, and you will be hated by all nations because of me. At that time many will turn away from the faith and will betray and hate each other, and many false prophets will appear and deceive many people. Because of the increase of wickedness, the love of most will grow cold, but the one who stands firm to the end will be saved. And this gospel of the kingdom will be preached in the whole world as a testimony to all nations, and then the end will come. On the earth, nations will be in anguish and perplexity at the roaring and tossing of the sea. People will faint from terror, apprehensive of what is coming on the world, for the heavenly bodies will be shaken. At that time they will see the Son of Man coming in a cloud with power and great glory. When these things begin to take place, stand up and lift up your heads, because your redemption is drawing near. Christians who are presently being humiliated, beaten, tortured, arrested, imprisoned, displaced, persecuted, and enslaved, will stand up with power of GOD enabling their starved, bruised, and broken limbs. They will lift up heads that Islamist Supremacists from al Azhar to ISIS, and from Mohammed to Anjem Chaudary, have attempted to push into the dirt. They will see their Redemption coming. Will we stand with them with upturned faces glowing with the Son’s beauty as He comes? Only if we stand with them now! Otherwise, we will have our heads lowered in shame, and be thinking — like goats — of excuses for why we did not respond with prayer and compassion to the plight of our fellow members of the Household of Faith. With ISIS, and terrorist jihadi attacks invading our own shores, with more to come, we are finally starting to feel the birth pains. As horrible as that is, it seems to have opened the eyes of more Western Christians to the persecution suffered by their brothers and sisters in worldwide Body of Christ. It is encouraging more of us to stand with the persecuted. Sunday, April 17, is only a beginning. It should be a line in the sand saying from now on we will Stand with the Persecuted, individually and together as part of that one same Body of Christ. We are grateful to see more and more Christians and churches getting involved in helping and praying for the persecuted! God bless your faithfulness! But as Faith mentioned, the seeming unconcern of the Western Church is perplexing. Disheartening when the majority of churches in the majority Christian nation of the U.S. are uninterested not even mentioning the most vulnerable in the Body of Christ. Even Israeli’s are asking why we’re silent of the impending holocaust of Christians in the Middle East. With all the information be shared today, how can church goers be completely oblivious that persecution is even taking place? I recall a conversation about our mission with a woman who never missed a Sunday. She asked, “You mean Christians are being persecuted like in the times of the Romans?” She was shocked and wanted to know more, a lot more. Closing our eyes and turning up the volume doesn’t negate the fact that Christians are more intensely persecuted today than at any other time in history. Some have shared that the church in the West cannot handle the ‘bad news’ of persecution. That they’re apt to run for the hills because we’re already overloaded with headlines of crises and persecution news may throw them over the edge. Others don’t want to scare off the ‘newcomers’. Who draws men and women to Christ, us or Him? Jesus said a servant isn’t greater than his master. He warned in advance that we would suffer trials and be hated because they hate Him. He said these things to encourage us, that those who endured until the end would be saved! Are we so arrogant to believe that persecution could never come to America? That we have been chosen to escape it? Many Christians in Syria have been shaken to the core believing it would never happen to them. (Read our exclusive report written by a Syrian Christian.) But in a short period of time, their world has been turned inside out. Pray for them as for the many others, globally, experiencing the same. But take heart, the Church is growing despite the extreme hardship! We’ve heard some say, I can’t worry about what’s happening on the other side of the world. I have enough to worry about here.” A great opportunity is missed when we turn a blind eye and close our ears to the suffering of the persecuted church. A part of our own ‘Body’ has been wounded, yet we don’t tend to the wound. The persecuted never fail to ask, “Pray for us!” and often ask for nothing more. Yet, many prayers are silenced in ignorance and never realizing the great need for support, their hands are stilled. We also miss the encouraging message in the example of unyielding faith demonstrated by the persecuted Church. Their witness causes us to examine our own faith. Can we be as strong? YES! They encourage us by proving all things, even endurance and victory in extreme persecution is possible through Christ our Lord. Hallelujah, glory be to God! Dear pastors, give your flock more credit. If they’ve been led to the cross, called and in Christ, they can handle the news! 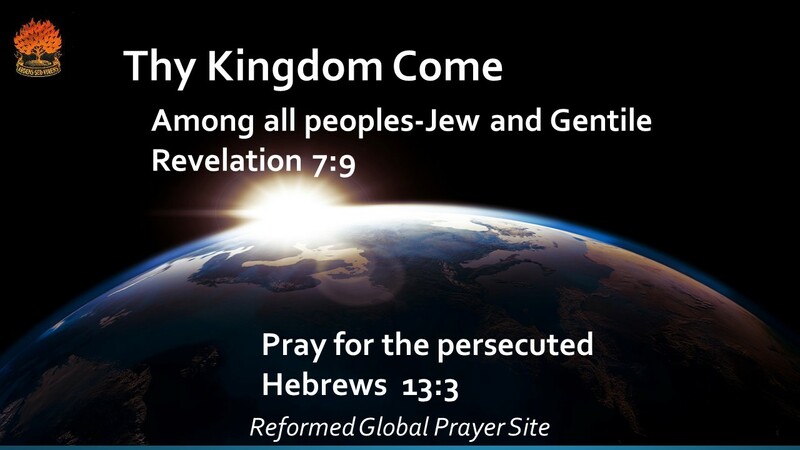 Our God will bend down to hear the resounding prayers of your congregation for the persecuted church! Also, an amazing voice for the persecuted could be sitting in your church, but unknowing…he, she or they are silenced. Agreeing with my friend from IRD, it’s never too late to Stand for the Persecuted! Don’t be discouraged from observing this important event if you have missed April 17. You can observe Persecution Sunday anytime, not only tomorrow but every Sunday! Today, let’s start by making it a point to care more, do more and pray more for the Persecuted Church! Our family in Christ. You can also go on the aid mission with us through your gifts! Keep raising awareness by being a Voice of the Persecuted, partner with us to come to their aid. But most importantly, keep praying for them! Please share this report and encourage you church and others to step out in faith for the persecuted. God bless and strengthen you.